During the addition or the edition of the message we have a possibility of adding also to him attachments using the button Attachements. 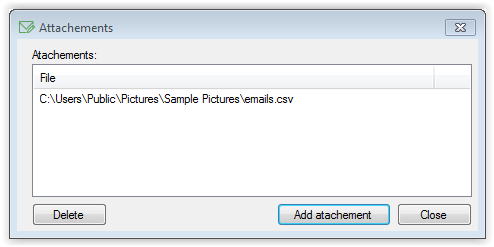 After the click the window will appear in which available are added attachments. Addings of the new file we will make across the click on the button Add atachement and to selecting the suitable file. We can both add as and remove the attachment. There will be enough to mark him across one click in the window, and then selecting of the button Delete. One can add every kind of the file. You must however remember about this that some servers for example Gmail reject letters the e-mail together with exe files such as EXE and MSI. Even if the file you will put in the archive ZIP Gmail also will reject such letter. A most important element this is that you will not be informed about this even. I recommend usages of links situated inside the letter to receiving of programs. One ought to pay particular attention on the size of the file together appendaged. Servers have restrictions regarding files sent behind their help. The emission of the mailing with the large file will last much longer due to the necessity of integrating of the element of the disk to the content the e-mail.